I tried to make a game mostly using tools available on the web. Being so short on time I built it out of off the shelf parts carefully picking my tools to build it rapidly. This blog post will introduce the tools I used and the difficulties with joining them together to make a game. 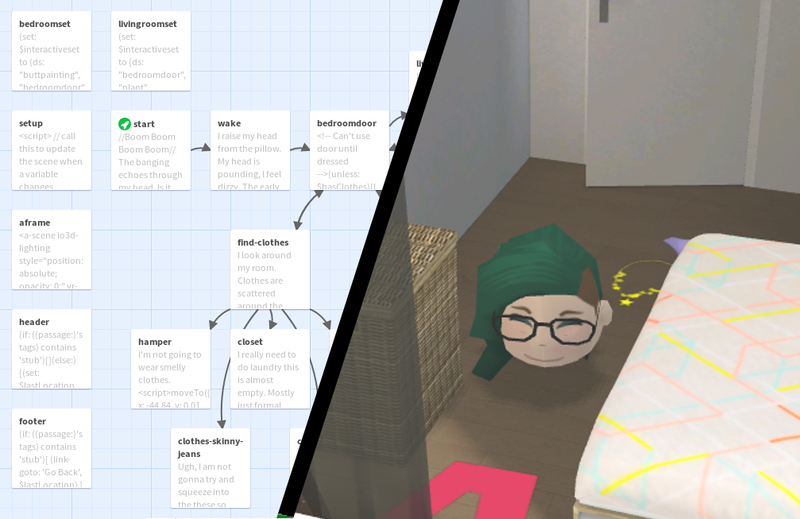 My goal for the game was to build a 3rd person rpg you explore either through interacting with the text or by exploring the 3D environment. Which works on phones and desktop computers. Having only a week of weekends and evenings to put it together (about 20 hours in total) I had to pick my battles very carefully. 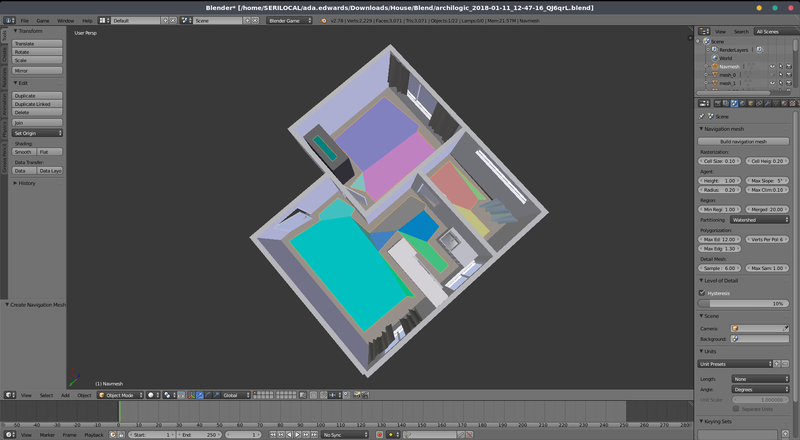 3Dio—An amazing tool for designing and exporting 3D architecture in the browser. Twinery — A really fun narrative game engine designed for producing text games it exports to HTML. Glitch — A service for building and hosting web software. Provides a developer environment and the capabilities for running a node server. Of these tools Twinery is the most prescriptive as it outputs the whole HTML file, which is what I will be publishing to Glitch. Because it is the most prescriptive it is what I will have to work with to add in my 3D features. A-Frame is designed to be used for virtual reality so it provides additional controls to use it with a VR headset. My game isn’t intended to be used with VR so I disable these controls by adding vr-mode-ui="enabled: false;" to the <a-scene> element. The A-Frame element I inject to the top of the page is by default hidden behind the Twinery story elements so I need to use some CSS to show the 3D scene. To do this I make the <tw-story> element transparent and ignore pointer-events. Also I move the <tw-passage> element to the bottom of the screen and let it scroll incase of long messages. Twinery has a place to enter CSS to do this I hide the tw-story I place the tw-passage at the bottom of the screen and make the a-scene fill the whole page. Now we have the funamentals set up I want to be able to control the scene from the Twinery passages. The default scripting engine in Twinery is called Harlowe, it is designed to manage dynamic text and traversing between different passages. Here is the code in the first passage. It displays some text and then some text the user can click on. If they press ‘Go back to sleep’ it replaces it with a new line of text urging the user to continue. //Boom Boom Boom Boom// The banging echoes through my head. Is it the door? Am I dreaming? (click-replace: ?gosleep)[//Boom Boom Boom Boom//, the unceasing poundings, echoes in my ears. 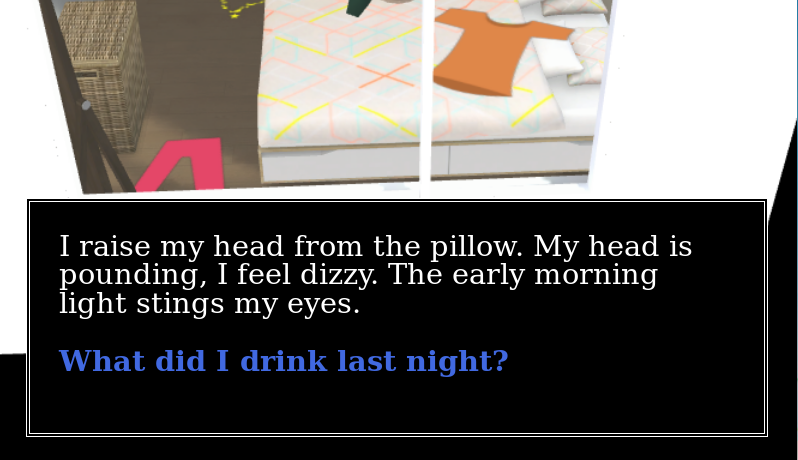 (click-replace: ?gosleep)[The box is now green. This can be used to control the 3D scene which is good enough for a one way binding in the scene where the 3D scene represents the game. This wasn’t quite enough for me I want a two way binding where the clicking the text can update the scene OR clicking the scene can update the game state. I can use these objects to manipulate the internal state of the game engine. I have seen some amazing A-Frame demos made with the Architecture tools of the great Archilogic team so I knew their tools would work with my scene. I spent a few hours building a scene. It was really fun, I felt like I was making it in the sims there was a wonderful selection of furniture. The most amazing feature in my opinion is the lightmap baking. Once i had built my scene it could automatically generate a baked light map which looks amazing!! This is normally something which is very time consuming to set up well so having it built in as a one button feature is wonderful! Look at the lights in the bathroom. The sunlight streaming through the shower curtain and being projected onto the wall!! In this case the position of the scene was displaced by 40 units in the x direction making it a little awkward to use until I moved the camera starting point to compensate. I added a 3D head to be the character it is a model I got commisioned a few months ago to use as avatar for me in VR experiences. I wanted to move it around the scene. <a-entity obj-model="obj: #ada-obj; mtl: #ada-mtl"
ada-model="eyes:3; mouth: 3;" position="-43.615 0.6 -0.312"
My first guess was to react to the use clicking on the floor and then moving the user there. Unfortunately this often resulted in the user walking in straight lines through geometry to get places. Fortunately this can be solved with a Navmesh. A Navmesh describes the areas of the scene a character can walk on. 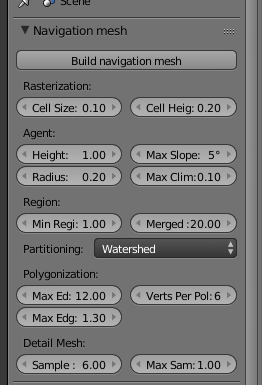 There are also tools to allow path finding around a Navmesh making it very useful for building explorable environments. To generate the Navmesh for this scene I first downloaded it as an OBJ model from the Archilogic website. Unfortunately it did not download any of the furniture models with it. But it would do. Close up of the settings I used. I followed the tutorial and tweaked the settings to generate the Navmesh for the scene which I exported as Gltf. I also added the scripts for the Navmesh A-Frame components to my scene so that I could make the character walk around. As well I added a camera which would follow the user. ada-model="eyes:3; mouth: 3;" position="-43.615 0.6 -0.312" id="target"
scale="0.08 0.08 0.08" shadow="cast: true; receive: false;"
<a-entity camera="fov: 50; zoom: 1;" position="-44 3 5"
We are now ready to add mouse interactions. To do this we will use a raycaster to work out where the user is clicking on the scene. It is a little complex so I will break down how it works. First I create a new rayCaster to use do the detection and I get a list of elements which I want to detect. Many of the objects in the Archilogic architecture are actually invisible and their geometry has been all joined into the scene. This breaks raycasting. Fortuantely the original objects are still present so first I have to make them all visible when I do a click. Once the raycasting is complete I hide them again so they don’t accidentially get rendered. We can now do the raycasting. We then interate over the intersections and filter out any objects we don’t care about. If the user clicks on the floor we use the navmesh component to move the user to that location. We’re now ready to start writing some story. 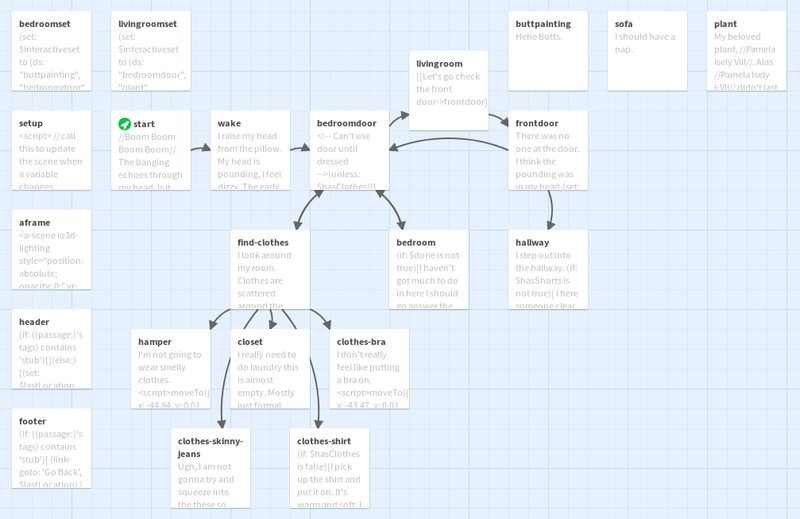 There is some additional functionality I added to handle some story elements. For example starting some passsages will trigger the character to move to walk to a new position. There is also some functionality for limiting the interactable elements to those in the room the user currently is. The server is on Glitch. Unfortunately a bug in Glitch prevented me from uploading the large HTML file. Instead I rename it and uploaded it to the assets folder as a plain text file. To get around this I made a small custom server. When a request for the page is made it downloads the file from the CDN and injects metadata for SEO and social media before serving it to the user. It is not an optimal solution but it worked in the limited time I had.